Rwebisengo Village, Western Uganda — Fifteen-year-old Gideon watches as his father, a poor 60-year-old man who cannot even defend himself, is cut in pieces. A pregnant lady is cut across the stomach and left to die as the baby hangs out. A mother is slashed to death immediately after delivery and the infant in left behind to suffer and die. A young lady watches her father cut in several pieces before she manages to escape. After the “slaughtering,” houses are burnt to ashes. My uncle’s home was demolished and a “bonfire” was made to burn all the beautiful furniture and household items. The horrible stories go on and on. Lendus, accompanied by anti Ugandan Government rebels, Mayi Mayi, and Entarahamwes (who are responsible for the genocide in Rwanda,) move from one village to another killing the Hemas and burning their homes. Before performing the killings, they drug themselves with certain herbs that make them very high, and they all believe in the power of witchcraft! They have vowed to eradicate the Hema ethnic group from Northeastern Congo. Over 10,000 Hema managed to escape from Northeastern Congo into Rwebisengo Village, Western Uganda. They are now helpless refugees. Most of them sleep in the open fields. The food supply from the UN is not enough, plus the Hema people are not used to eating maize (corn) flour. They have no choice but to learn to eat whatever is put before them. The small clinic is full of wounded Hema casualties. Rwebisengo village is a very dry place; the local people depend on food supplies brought to markets from neighboring villages. There is no running water or electricity. One can only imagine what outbreak of diseases will come out of this. Children always suffer the most. How can they fail to have their lives changed forever when they witness their parents butchered before them? Local people are trying to do their best to help. Several homes are full of refugees numbering from 20 to 200 in each home! In the 19th century there was a brutal war between the Lendu and Hema tribes. Hema had guns, but the Lendu had arrows and spears. As the war went on, many Lendu were killed as well as the Hema. However, the Hema ran out of ammunitions, and the Lendu turned around and killed all the Hema and their two kings who had gone to battle. They cut off the head of one the kings and up to now they have the skull and always show it to their children as a reminder of the terrible battle. Revenge still continues from the Lendu. The current Hema kings do not mistreat the Lendu. They have lived in harmony until, in the recent years, the Lendu have started the killings. This is the third time they are doing this act — since early 90’s. The Lendu have their own kings or chiefs. They are very hard working people and many of them have good education and good jobs. They are not under any suppression from the Hema. There is no reason whatsoever why they should be taking revenge for what happened in the 18th century. Blame also goes to the other parties involved who have used this excuse to wipe out the Hema tribe. The people who are being killed now are innocent. We need intervention here to stop the killings. Innocent blood is being shed. This is not a simple matter. The brutal killings must stop. These people need help. We are calling on international bodies to look into this urgent matter. We cannot wait until thousands of innocent people have been killed. There needs to be reconciliation between the two tribes imposed by outside forces. This must not be carried on to future generations. 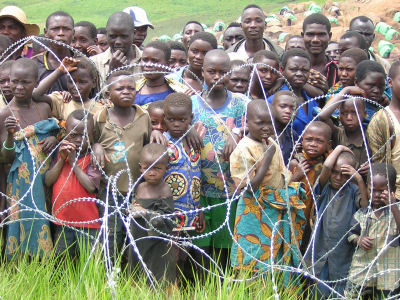 Almost 10,000 refugees in Rwebisengo village, in Uganda need financial assistance. We are appealing to charitable organizations to send in their representatives to verify the situation and send in help. It is heart breaking to see people sleeping in the open, children suffering and the wounded in pain. Those interested in helping, please contact your local Ugandan Embassy. I am sure they will be glad to direct you on how you can help. Of course the Uganda Embassy has not asked me to write this, however I feel they are the right office to handle this matter. I am appealing for help. We cannot sit and wait to see what will happen. This is going to be like the genocide in Rwanda. By the time the world came to help, over a million Tutsis had been killed! I appeal to organizations and individuals around the world to step in and assist the refugees in Rwebisengo village before hunger and poor sanitation kills many of them. Lastly I would like to thank President Museveni of Uganda for all the work he is doing. People do not understand what is going on in the Congo. It is easy to say, “Uganda get out of the Congo!” Uganda is not after Congo’s rich minerals! They are there to protect Uganda and help the innocent people who are being killed. My sincere thanks go to the Uganda Army who have worked tirelessly and risked their lives for the sake of others, but they need help. The world cannot condone this wanton killing. Evil always prevails when good people do nothing. This horrible situation cries out for good people not only to give aid to those who suffer but to stop the killing.